Cheddar Cheese (just to grate over the mashed potato). Chives, Dill and Parsley - from jars you can buy, or fresh if you have got it. 1 packet of Puff Pastry. 1 egg to coat the Pastry. This week we’re bringing you an unusual pie recipe all the way from Cornwall, England that was given to us by Colin Matthews. Here’s what Colin says: I work as a film actor/extra in Cornwall, and only last month I worked with a chef from Rick Stein; I shared my recipe with him. He said “we put the potato on top.” I replied “yes, but with mine the juices soak into the potato.” I have been cooking for some 25 years – food to eat and not put into picture frames. Pre-heat the oven to gas mark 4, 350ºF, 180°C and grease a pie dish that’s approx 21 cm x 14 cm x 6 cm in size. Wash the prawns and cut the trout fillets to bite sized chunks. Place in a large saucepan with the peas and just cover with milk. Add the chives, dill or parsley – just a little black pepper, then poach by bringing the milk to boil, just to bubble in the sauce pan, then allow to cool. Prepare the potatoes by boiling until soft, drain and just add a little butter and mash until there are no lumps. Spread the mashed potato on the bottom of the Pyrex Dish, then grate some cheese over the mashed potato, then add the fish and prawn mixture over the potato and cheese. 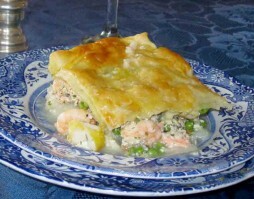 Serve with steamed leeks, green beans or sweet corn; and to compliment a glass of chilled white wine. If you liked this special Goatsbridge Trout recipe, you can buy our fish fillets in bulk, skinned and boned from our online shop, from our farm shop in Thomastown, County Kilkenny or in all good Irish supermarkets, including Supervalu and Dunnes Stores as well as specialist shops around the country. I’ve tasted this and so I can verify it is delicious. That’s my man – so proud of you !